It gives me great pleasure to write the foreword to this book about karate that will surely take its rightful place within the international sports community. Sport Karate has become a massive phenomenon across the globe involving millions of families spanning countries within all five continents, and thus deeply entrenched in global society. The World Karate Federation is the only organization to have achieved consensus among innumerable visions, styles and cultures of Karate. It is now the focal point for National Federations, supporters, referees, coaches, athletes and recreational practitioners. The WKF has driven the evolution of Karate from an esoteric Asian martial art into a captivating and dynamic sport with global appeal. Through four decades of diligent investment in the safety of Karate athletes, standardized coaching and refereeing competence, as well as contemporary media promotion, the WKF has brought real-time, world-class karate into the lives and living rooms of anyone, anywhere on the planet. The WKF has thus provided a way for citizens of all countries to improve their lives by participation in any aspect of Karate – from recreational activity to high-performance competition - and form enduring relationships that transcend boundaries and promote intercultural understanding. After almost half a century of innovative success, the WKF looks forward to continuing the multifaceted development of Karate for the benefit of humankind. 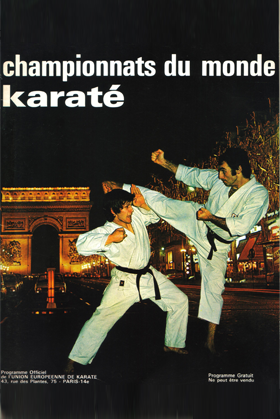 After several decades of rapid worldwide growth, several competitions started to attract karate athletes from several countries during the 1960s. The different styles of karate, diversity of the rules and lack of unified protocols that govern any type of competition indicated a need to create an international governing body comprising united National Karate Federations that could start to address these issues from a unified global perspective. Ryoichi Sasakawa, President of the Japan Karate Federation (JKF) and Jacques Delcourt, President of the European Karate Union (EKU) jointly proposed a series of meetings that would produce not only the first amalgamated international rules for sport Karate, but also the establishment of the World Union of Karate Do Organizations (WUKO) on October 10, 1970. Tokyo was the site where WUKO was inaugurated and where the first WUKO World Championships were held. 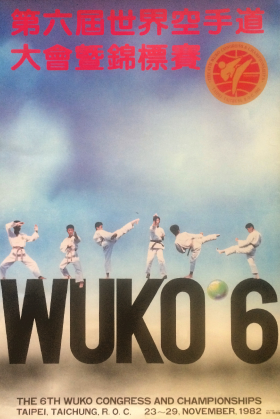 Portland, Oregon hosted the first meeting of the fledgling WUKO Directing Committee, the objective of which was to lay the foundation for the future of unified sport Karate. National Karate Federations recognized by their National Olympic Committees and Highest Sport Authorities soon became members and thus WUKO became the most important world governing body for Karate. The success, scale and media impact of the event was immediately recognized worldwide as an innovative milestone in the development of sport Karate. Since then, the competition has been refined to the point of incomparable sophistication in terms of technical Karate quality and of credibility as a showcase sport event that reaches millions of karate practitioners in all corners of the globe via state-of-the-art communications tools. 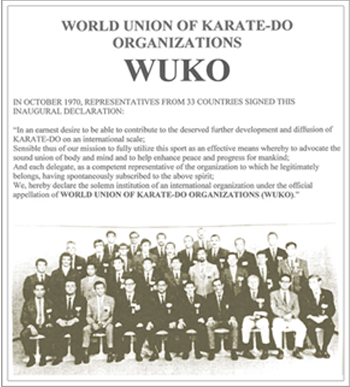 The integration of several new organizations during the 1990s saw WUKO membership increase to 150 National Federations. Therefore, a new name that would more accurately reflect the size and scope of the organization was needed. 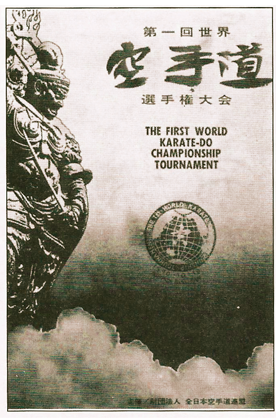 The name of the first International organization representing sport Karate was thus changed to World Karate Federation (WKF) on December 20, 1992. President of the Federation of All-Japan Karate-Do Organizations, he promoted intensely the creation of an international Karate organization. 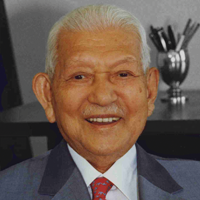 He was elected 1st WUKO President in 1970. 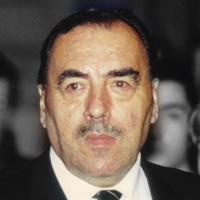 As the President of the French Karate Federation, he promoted first the creation of the European Federation, being its first President and later on being the President of WUKO until 1998. 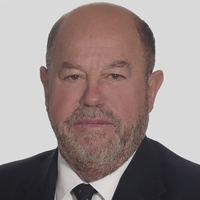 He is the current WKF President. 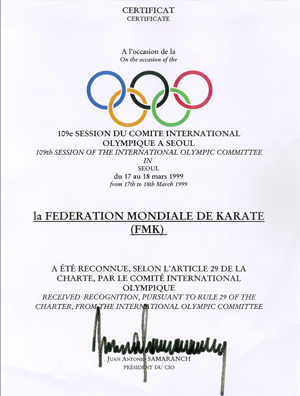 During his mandate, the WKF obtained the IOC recognition as the sole official organisation representing the sport of Karate at an international level. The Tokyo World Championships paved the way for a remarkable evolution in international Karate competition over the next three decades. That inaugural event comprised only male team and individual Kumite. Kata divisions were introduced and women were included for the first time at the Madrid World Championships a decade later during 1980. Current competition comprises a total of four male and female kata divisions and twelve male and female kumite divisions. The incorporation of divisions for Persons with Disabilities into the World Championships merits special mention. The overwhelmingly positive public response to these exceptional athletes validated the perception of karate as an activity in which all humanity can participate. 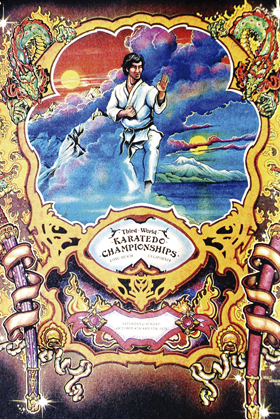 The significant growth of WKF during the 1980s and 1990s resulted in a consolidated organization that fully represented sport Karate at the international level. This legitimacy was confirmed in 1999, when the IOC officially recognized WKF as the sole governing body for sport Karate in the world. The five colors in the WKF logo symbolize the universal nature of Karate as a sport and of the organizational structure that governs it. The IOC shortlisted Karate during 2004 as a candidate sport for inclusion into the 2012 Summer Olympic Games. 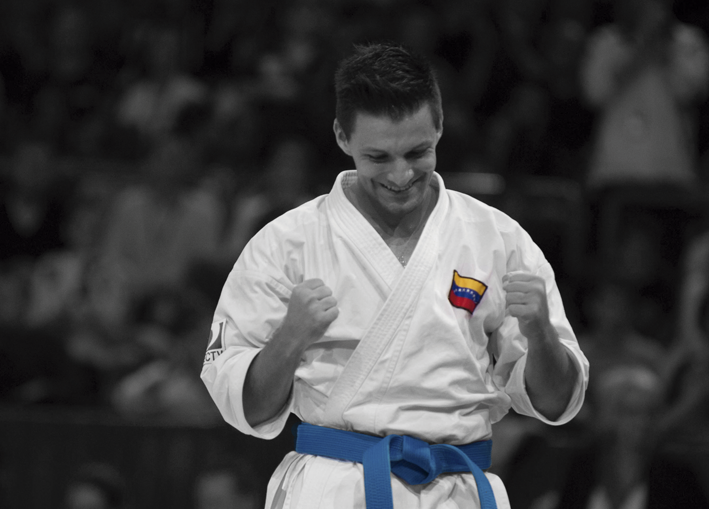 This complex path encouraged Karate to undergo major development and facilitated the introduction of improvements to ensure the safe participation of athletes in a modern, visually attractive sport. The WKF has petitioned the IOC to consider the inclusion of Karate in the Olympic Games three times. 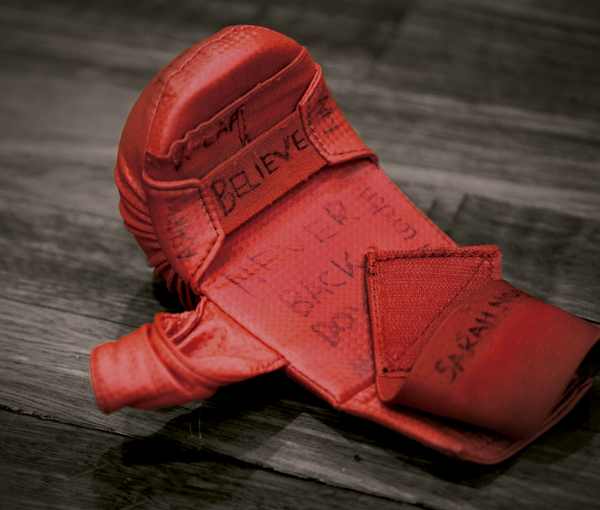 A campaign in 2012 was targeted towards demonstrating the effort applied and the evolution of sport Karate to conform to all Olympic ideals during its journey on the "Olympic Way". 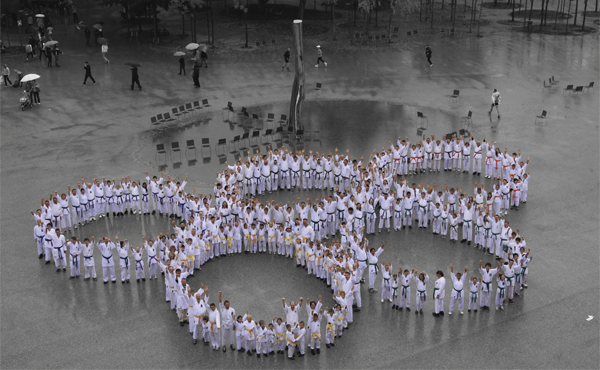 This campaign reached millions of supporters that identified with the "K" symbol, which is has since become an emblem of Karate and its Olympic aspirations. Among the many advances that The Olympic Project facilitated, most were directed towards changing the nature of the competition to improve sporting practices and create attractive events. One of the most obvious transformations that has had enduring visual impact has been in the competition layout, which now comprises four aligned areas during the eliminations and one elevated area during the finals. These transformations have rendered Karate competition readily understandable for fans, more visually attractive and have clarified refereeing practices with more objective, simpler and fairer rules. Gender equity, the incorporation of athletes with disabilities and various age groups into competitive divisions, have notably increased athlete participation. Quadrennial approval processes that ensure the incorporation of contemporary protective devices have maximized athlete safety. Application of the WADA anti-doping program now guarantees competition transparency and educates participants about the importance of practicing a clean sport. Television and Internet coverage has significantly evolved to bring live WKF competition to all and has allowed that Karate takes its rightful place among international sport events that have worldwide followings. 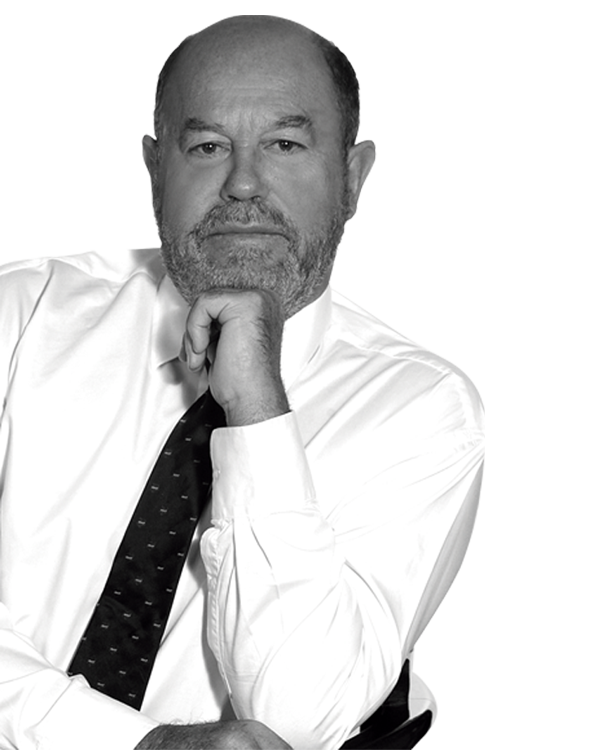 Referees are integral to WKF function. They actively collaborate to refine competition rules that render WKF competition as fair and objective as possible through ongoing training and assessment programs. These encourage the incorporation of new referees and maintain the competence of qualified referees. The evolution of Karate as a sport is accurately reflected in the changing nature of the World Championships of the past four decades. The present five-day World Championships includes 1200 athletes from over 100 countries and attracts thousands of supporters to stadiums, with millions more following via TV and Internet. The expectations generated by today's World Championships demands global diffusion. The WKF produces satellite signals through which TV and Internet channels can offer live competition in high definition. The World Championships are televised live in over 120 countries and the WKF YouTube channel also allows the remainder access to these events in high definition. The WKF and its Continental Federations organize annual and biannual competitions in male and female cadet, junior and senior divisions. These competitions proceed worldwide with the endorsement of 188 National Federations and anyone can follow them from any point on the planet. An estimated 100 million individuals are involved with karate and the WKF Internet channel surpassed 10 million views within the first 18 months of existence. 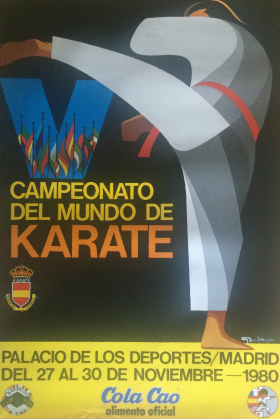 WKF is active in popular social networks. Thousands of supporters are kept informed daily through the WKF Facebook page where diverse information is available about Karate culture, philosophy, history, values, competitions, athletes, and other types of current, relevant information. The WKF supposes that the ultimate approach to broadcasting Karate is via the WKF YouTube channel. 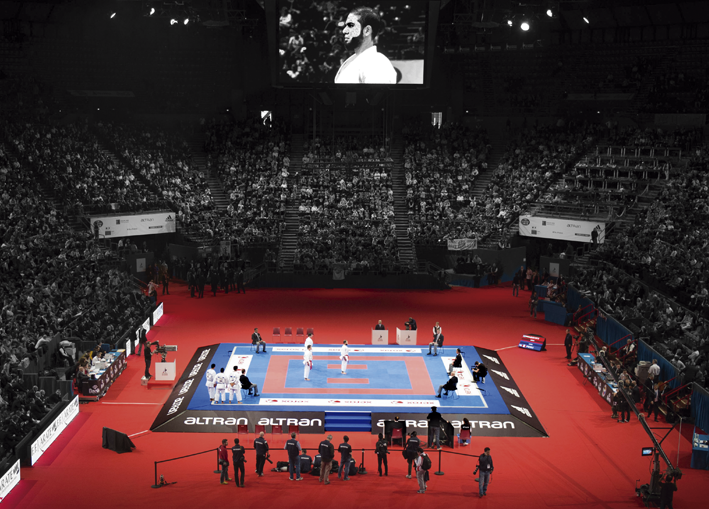 Worldwide audiences can enjoy and appreciate superlative performances by elite Karate athletes thanks to high-definition video. The official WKF website integrates the Federation activities in terms of sport and administrative issues. Results and databases for each competition are published in real time. 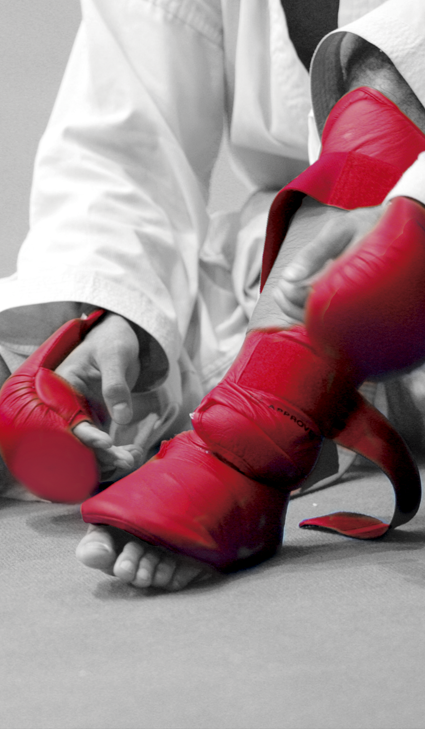 Karate has become the sport of reference among Martial Arts. Although youth comprises the majority of Karate practitioners today, a wide range of individuals enjoy Karate and shar e its values of respect, humility, social integration, physical and mental balance, rejection of violence and overcoming difficulties. These positive values are important qualities that have considerable public appeal. Sport Karate benefits from technological innovations, such as the recently introduced Hawk-Eye system of video replay. This system serves as an impartial second opinion and thus facilitates referee decisions and adds excitement to competition. Others include the use of mobile devices such as tablets and phones to follow competitions in real time. Such progress and constant evolution epitomize the spirit that defines the WKF. The WKF is the only organization that has succeeded in uniting all of these different facets under one roof. As the home of world sport Karate, WKF is the focal point for its member federations, supporters, referees, coaches, and above all, its athletes. Karate has evolved throughout almost half a century to become the exciting, charismatic and dynamic activity that so many enjoy today. With your help, WKF will continue to evolve and improve Karate for the benefit of humanity for many mor e decades. After all, what makes our lives so enjoyable?